Brain tissues are especially rich in phosphatidylserine (PS), but aging causes a decline in the PS content of cells throughout the body. 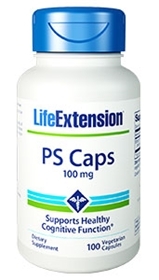 Research has shown that in addition to improving neural function, PS enhances energy metabolism in all cells, memory, concentration, learning and word choice. In the brain, PS helps maintain cell membrane integrity and youthful synaptic plasticity. Phosphatidylserine (PS) may reduce the risk of dementia in the elderly. Very limited and preliminary scientific research suggests that PS may reduce the risk of cognitive dysfunction in the elderly. The FDA concludes that there is little scientific evidence supporting this claim. Other ingredients: rice flour, silica, gelatin, and water. Contains soybeans. Contains rice. This product contains NO milk, egg, fish, peanuts, crustacean shellfish, tree nuts, wheat, yeast, gluten, or corn. Contains NO sugar, and no artificial sweeteners, flavors, colors, or preservatives. The genisten in soy can interfere with the ability of radiation to kill cancer cells, though there are contradictory studies on this issue. When undergoing treatment for cancer consult your healthcare practitioner before using this product.